I went to see Ian R Crane live in Birmingham a couple of months ago, see: http://hpanwo.blogspot.co.uk/2012/04/shift-2-with-ian-r-crane.html As I explain in the article, the venue was opposite St Chads Cathedral and the sight of that place brought back some deeply unpleasant memories to me. It was all connected to a holiday I took in 1997. 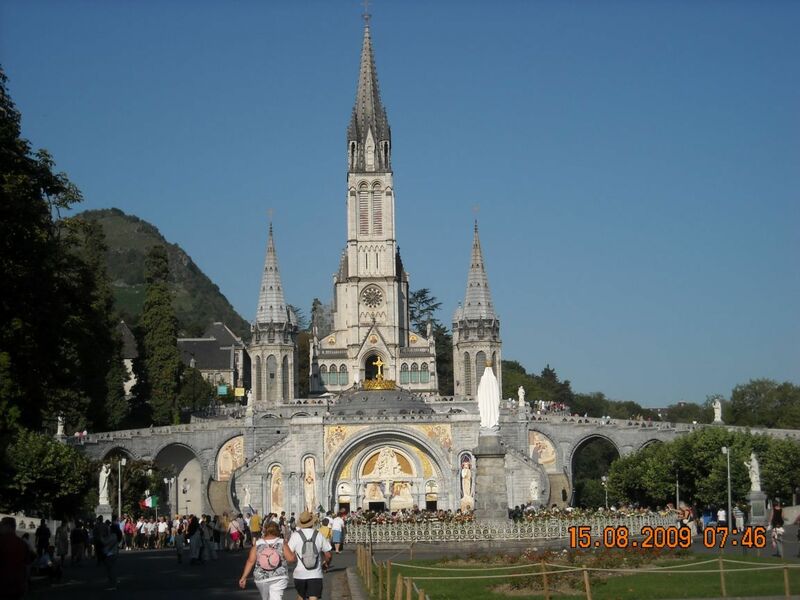 I went on a pilgrimage to the holy shrine at Lourdes. This was an experienced that marked a major turning point in my life. I've mentioned several times that I'm from a Roman Catholic family. My mother was a Dutchwoman from the county of Limburg in the south east of the Netherlands, which is the only Catholic province in a predominantly Protestant nation. (Also it's quite hilly, which makes it unique in the Netherlands in another way). When she married my dad he converted from his Bristol-Welsh Anglican roots. My mother's very orthodox upbringing combined with my dad's conversion must have caused some discussion among the newlyweds which led to them raising me and my brother in a fairly irreligious and liberal environment. My mother refused to have me baptized, much to her parents' consternation, but she wanted me to make up my own mind when I was old enough. For this I'm very grateful to her; I had my own daughter baptized and wish now that I hadn't. I chose of my own accord to be baptized Catholic when I was aged 17 and received my first Holy Communion at my family's local church in Oxford. However my Catholic beliefs were to be extinguished forever within a decade, and that pilgrimage to Lourdes in 1997 was a very big bucket of water thrown on the fire. Lourdes is a small and a wannabe insignificant town in the foothills of the Pyrenees mountains in southern France. It has a native population of just 15,000 but has to cater for over 5 million visitors per year, making it one of the world's most visited locations. In France only Paris has more tourists, and in the world only Mecca has more pilgrims. The reason for all this attention is that in February 1858 Bernadette Soubirous, the 14-year old daughter of a poor miller, claimed to have seen a "beautiful lady" whilst collecting firewood in a rocky grotto beside a nearby river. This "lady" was small, about three feet high, and was standing in a niche high up in the rock wall of the grotto. At first her parents didn't believe her, but when Bernadette went back to the grotto a few days later she saw the lady again. This time she had brought some holy water with her to throw at the apparition in case it was from the Devil, not God. It's important to realize while studying this case that the community she was growing up in was intensely religious. Everybody was a devout Catholic and any other worldview would have been unthinkable and incomprehensible. The next day Bernadette went to the grotto a third time and on this occasion the being spoke to her, in perfect Gascona, Bernadette's native language, that has been supplanted in Lourdes by French and today is extinct. The apparition asked her to return to the same spot every day for a fortnight. Bernadette did as she was asked and every afternoon knelt down to pray in front of the grotto carrying a candle and her rosary. Each day more and more people gathered to watch her. At first just the girl's family followed her, but within five days crowds of several hundred clustered on the riverbank and stood silently while the young girl prayed. Although only Bernadette could see the being, other people started to believe her and some already began wondering if Bernadette was seeing the Virgin Mary. The ninth appearance of the "lady" is the most interesting. The apparition instructed Bernadette to have a drink. The girl thought it meant the river and went over to the bank, but then the being pointed at the ground inside the grotto. Bernadette turned over a few stones and saw a puddle of damp mud. She began digging with her bare hands and soon water began to flow out of the ground. Bernadette had discovered the famous Lourdes Spring. A few weeks later some builders moved in and created a small brick tank to collect the water; today a huge network of pipes and taps are plumbed in leading to fountains, basins and the bathing pools. Three days after Bernadette dug up the spring a local woman washed herself in it and had her paralyzed arm instantly healed. The doctor who examined her could find no medical explanation for this; it was the first of the hundred or so "Lourdes Miracles" that have taken place over the years. On one occasion while Bernadette was kneeling and praying in the trance-like state that she always experienced in the presence of the "lady", the candle she was holding melted and the flame licked her hand, but on later examination her hand was found to be stained with soot, but completely unharmed. By now the Church authorities had got involved. Bernadette's local priest, Father Peyramale, called the girl a liar and approached the local bishop for help. This was aggravated by the being's request, relayed by Bernadette, that they should come to the grotto in full procession and build a chapel there. The bishop ordered Peyramale to stay out of it. However the next day the bishop asked Bernadette to tell them who the lady was. Bernadette asked, but the lady didn't reply and "just bowed her head and smiled". It was only three days after that, after Bernadette repeatedly badgered the being with the same question, that it finally looked at her with a serious expression and said: "Que soy era l'Emaculada Concepciou", this is Gascona for "I am the Immaculate Conception". It seems there was a lot of political pressure both for and against Bernadette's actions within the church and local government that is hard to follow. At one point it is said that Bernadette's father was offered a "Golden Louis", the biggest denomination of currency at that time, which could have lifted the family out of poverty by "somebody" in exchange for Bernadette making a false confession, telling everybody that she'd lied. The full story can be studied in one of the many badly-translated guidebooks that the visitor can purchase from the numerous souvenir shops in Lourdes, but the most detailed account comes from Franz Werfel's so called "novel", The Song of Bernadette. This was published in 1942 and made into an Academy Award-winning film two years later. Werfel was not Catholic himself, nor was he French. He was a Sudetenlander German and a Jewish refugee from the Nazis. He settled in Lourdes while he was on the run from the French "Collaborators" and met many elderly people who had known Bernadette as children and remembered her. He claims to have based the book on their testimony. The basic factual account of what happened was recorded by the Church and by local authorities, but much of the unwritten and underlying goings on, after over one and a half centuries, I think are open to interpretation and debate. Nevertheless, since the days of Bernadette Soubirous' experience, Lourdes has become the second biggest pilgrimage destination in the world and in 1997 I was one of those pilgrims. My brief few years as a Christian-believer began at a time of my life I have trouble remembering. I do have "missing time" in my life, but not just a few hours; on and off, a number of years! The period between the ages of about 15 and 23 are full of these lacunae, in fact I occasionally meet up with people whom I met during those years who greet me and I don't recognize them. But for motives I can't recall today, at the age of 17 I decided to be baptized; I must have experienced a feeling of what Christians call "faith" a belief that the God of the Bible: Jehovah, Yahweh, what the Muslims call "Allah" and the Freemasons "Adonai", was real. The Birmingham Diocese, which includes Oxfordshire where I live, has organized a pilgrimage to Lourdes every year since the 1950's and over a thousand people travel there annually with the group. It's still going on today and the 2012 pilgrimage took place this June, see: http://www.birminghamlourdespilgrimage.com/ Here's an article in Catholic Today about the event, including photoes: http://www.catholic-today.co.uk/component/k2/item/152-lourdes-2012 . I recognize a few faces from these images, individuals who are clearly still involved today fifteen years later; I won't say which ones for reasons that will become clear. I joined the pilgrimage at South Mimms service station on the M25 just north of London and was immediately approached by a bouncy, grinning young man who introduced himself as Father Alfie, the chaplain of the Diocese's youth section. He was unlike any priest I'd ever seen, dressed in Bermuda shorts and a Hawaiian shirt; only his loosely-fastened dog-collar identified him as a man-of-the-cloth. Alfie is not his real name; I will be giving false names to everybody I refer to on this pilgrimage, with the exception of Mike Stanley and Jo Boyce. We boarded the motorcade of coaches and headed off to Dover. One of the coaches was called a "jumbulance", a vehicle specially adapted for the disabled pilgrims. I'm very opposed to political correctness, but I do find using the word "sick" to describe them as somewhat demeaning. We crossed the English Channel on a ferry and then boarded a chartered train at Calais which took us overnight to Lourdes. The train was similarly adapted as the coach and the French railway service must be used to the massive visitor-load that Lourdes experiences. I was a bit emotionally overwhelmed to arrive at Lourdes, one of the many times I was emotionally overwhelmed during the time I spent there. The area around the grotto where Bernadette had her visitations has been converted into a holy sanctuary on a scale that matches the Vatican. The land around the grotto was bought by the Church in 1864 and pieces of the surrounding area were added over the years until it reached its present size of 126 acres. The Domain, as it is called, has a huge esplanade running in a straight line to the hill above the grotto. On the top of that is the Rosary Basilica, see the photo above, which is a beautiful sight. Leading off from these are numerous other Basilicas and chapels, all spotlessly clean and decorated with a grandeur I've never seen before or since. There's a Stations of the Cross route which has larger than life statues and a huge underground chamber called the Basilica of St Pius XI which has the most magnificent acoustics. When the organ is played there it made me quiver at the knees! Every evening there's a very moving torchlight procession that goes up and down the esplanade accompanied by music, see: http://www.youtube.com/watch?v=f4reKbaO_50 When I look back now, I can see that the Church uses extreme sights and sounds, like those in the Domain to "shock-and-awe" its adherents in order to control them. The overwhelming feelings I had are probably shared by almost everybody who arrives there. Life on the pilgrimage was easy and slow and the eight days we were there felt like eight weeks. As a member of the youth section my duties were to be a "brandcardier", which is not that different from my ordinary working duties of being a Hospital Porter; so much so that it was almost like being on a "busman's holiday". My job was to transport the "sick" pilgrims from their hostel, which was a big, modern hospital-like building called L'Accueil de Notre Dame, to the places of worship in the Domain for mass each day. These masses were extraordinarily elaborate and took several hours. Up till them I'd only been used to the services at my local church and this was a new experience for me. In the afternoon and evening there'd be another outing, to the Stations of the Cross or a musical concert or other events. Then the brancardiers would all head for the local bistroes to have a few beers, usually accompanied by dancing and singing. I said above how the Catholic Church has become adept at using grand architecture, glorious music and elaborate spectacles to turn the heads of its congregation, but in recent years it's become quite good at the happy-clappy, guitar and tambourines, touchy-feely stuff too. In fact it's almost New Age in some of the things it does at Lourdes. Instrumental to this aspect were the musical duo Mike Stanley and Jo Boyce who attended the event every year. Despite completely lapsing since first meeting them I still think they're excellent and still enjoy their songs, which without the Christian-themed lyrics at times approach a Celtic and pagan naturalist sensibility, like Song for the Trinity and Bread of Life, see: http://www.cjmmusic.com/ (I see that Mike has come down with cancer. I'm sorry to hear that and I wish him a speedy recovery) Here they are on the BBC's Songs of Praise: http://www.youtube.com/watch?v=MLjM8IlrVrk . It all sounds wonderful, doesn't it? And in some ways it was. It was deeply intense, joyous, carefree and very nicely ungrounded without being wantonly so; but it had a false and dark side to it. The pilgrims were governed by a pseudo-military structure. We all had uniforms, which as you can see from the photoes were a blue, branded T-shirt and a yellow neckerchief, and badges to identify our roles. We were run by a Chief Brancardier who in turn had a team of deputies who dispensed orders to foot-soldiers like me. The deputy who was head of my section was an obnoxious and two-faced little man called Martin. He took an instant and groundless dislike to me, as some people do, and took every opportunity he could to wield his authority against me. "Come on, Ben, chop-chop!" he once sneered at me very loudly in front of everybody when he decided I was pushing my antiquated voiture, a "sick" pilgrims' transporter handcart, a tad too slow. This made me feel very embarrassed, not least because one of the people watching was a small, dark-haired and dark-eyed young woman called Claire whom I'd become rather sweet on; in fact in the heady atmosphere of the location, I'd experienced with her what the French call a "coup de foudre". Martin picked up my attraction for Claire straight away and used to be especially unpleasant to me when she was around for that reason. I wasn't the only person he grated on; many others on the tour found him pompous and abrasive. And, as I said in the Ian R Crane article linked above, he misled me over the day of the St Chads mass. The fact that somebody like Martin could rise to a position of authority shows that there's a serious snake in the Lourdes garden. Of course people like that always float to the top in conventional organizations, which begs the question: how unconventional is Lourdes? However there's a silver lining to this cloud in that Martin was the biggest inspiration behind the character Trevor in my novel Rockall, which I began writing soon after coming home from the pilgrimage, see: http://hpanwo-bb.blogspot.co.uk/2009/02/rockall-chapter-1.html . My brother, who accompanied me on the pilgrimage, kept very quiet during the trip but afterwards I found out that he shared my cynicism, and, if anything, felt it even more strongly. As you can see from the link above about this year's pilgrimage, the Queen's Diamond Jubilee was celebrated in the same way it was back in Britain, see: http://hpanwo-tv.blogspot.co.uk/2012/06/lizard-in-city.html . While I was there we also had to watch a military parade because the "Perigrimage Militaire" was in progress. During that week Christianity is not the only religion worshipped there; as Dr Lawrence Britt said in 14 Signs of Fascism: "Soldiers and military service are glamourized and glorified". There are aspects of my pilgrimage to Lourdes that I've not mentioned here because I still find it too painful to write about, even after fifteen years. However I don't want people to get the idea it was all nasty; it wasn't. I very much enjoyed the friendships I made with the "sick" pilgrims I cared for and one day I took a few of them out to a bistro with one of the other deputy-chief brancardiers; not Martin, a nicer one whom I liked. We had one of the most enjoyable times out I've ever known and I'll never forget it. The "sick" men were all Irish and I still laugh when I remember them trying to explain to the French waiter that they wanted a "real Guinness". I also met an amazing man called Brother Brendan who was a Sacred Heart friar. But he was not your popular image of a monk at all! He used to like a drink, he smoked and he swore. I kept in touch with him for a while afterwards; he was great fun. So there were good times there as well as bad, but would I go back there again? No. Bernadette Soubirous entered a convent when she was 22 years old. There, as Sister Bernadette of the Charity of Nevers, she worked as a nurse and used to produce works of embroidery. Never in the best of health, she died of tuberculosis at the tender age of 35. She was canonized by Pope Pius XI in 1933 and her feast day is April the 16th. When I look back at her experiences, now more scientifically-minded than I was back then, I wonder what the truth was behind what happened. I do not accept the Skeptics' dismissal of the Marian apparition at Lourdes as hallucination, hysteria, corruption and the various other straw-clutching cop-outs that the likes of Richard Dawkins wheel out; see here at 2.31: http://video.google.co.uk/videoplay?docid=9002284641446868316 But at the same time, I wonder what would have happened if the entity Bernadette encountered had appeared in a place where there lived people of a different culture and mindset. You see, apart from Bernadette's statement that the being had said: "I am the Immaculate Conception" there is nothing else at all to identify it. In a society like the one Bernadette lived in I wonder if the appearance of a benign feminine entity, or "gynaeform phenomenon", would have been accepted as anything other than what it was. When Bernadette first saw it she wasn't sure; this is why she took the holy water the sprinkle on the apparition. She thought it might be the work of the Devil or a soul escaped from Purgatory. I no longer believe in the Immaculate Conception but I do accept that people experience very real encounters with non-physical beings. These come in all shapes and sizes, like aliens, ghosts, Djinn etc. They can be friendly, hostile or indifferent in personality. 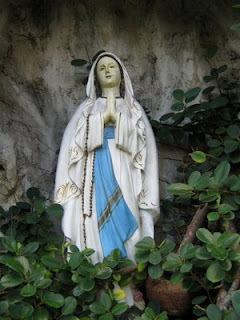 Sometimes, in areas where the people are secular or a different religion is predominant, entities are seen that also appear as a human female, just like at Lourdes. These entities are often very friendly, even loving. They may provide healing and spiritual inspiration. If one of these appeared in such a society, like modern Britain, and they do occasionally, they'd be described as an "angel" "she-elf" or "goddess". I don't wish to offend any Catholic devotees of Lourdes who are reading this article, but I feel I have to interpret Bernadette's experience, and its legacy, in terms of the culture it emerged in. I repeat: I do not for a moment suggest that Our Lady of Lourdes does not exist, only that she may not be what most people think she is. Bernadette describes the "beautiful lady" as being clad from head to foot in a white dress with a white headscarf; only a light sash around her waist was blue. All the other Marian images I've seen depict the mother of Jesus in bi-colour, usually with a white dress and blue headscarf or vice versa; occasionally you'll see another bi-colour clothing depicted, like brown or green. This is the image of her Bernadette would have been familiar with. The most unusual feature of the being was that she had two yellow flowers clasped between her toes; this is nothing like the popular image at all. On the other hand I could be completely wrong, and it could be that the Blessed Virgin Mary does exist, but I doubt that very much, and there are many reasons for my doubt which are too big a subject for this article. One thing that I'm sure of is that Bernadette's encounter with this beautiful, loving being was completely real and it had an enormous impact on her life and many other people's lives, it was an influence for the better in most cases. I would never take that away from them. But I still think she should belong to nobody. The Vatican has claimed this entity as its own, given her a label and decided how the people who visit the place where she appeared should interpret her. I resent that deeply. Wow I never knew Lourdes looked like that, I thought it was a simple outdoor place. I was brought up a catholic - one of the best things that ever happened to me was being hospitalised for months when I was 18 so I couldn't go to church, it 'broke the spell'. Thanks for your story Ben - your humanity has always warmed me. Hi Alex. You're welcome. Glad you got something out of it. Good to hear from you again. That photo is very creepy. Once again the authorities are flashing a big prick over the bones of young men who were ritually sacrificed! how ddid you do all this without a passport? CRANE LICENCE TRAININGCrane Ticket for Mobile Cranes, all categories from CV to CO "open ticket" - cranes over 100t capacity. Get your crane ticket now!